John Schultz returns, looking to become the third straight player to win 3 straight games. And I return, itching to share one of my favorite medieval stories. Speaking of streaks, I hope you got a chance to check out my post from earlier today – a visualization of the winners of the last 1,830 regular episodes of the show. If Lauren doubles her score, she’ll have 32,000. 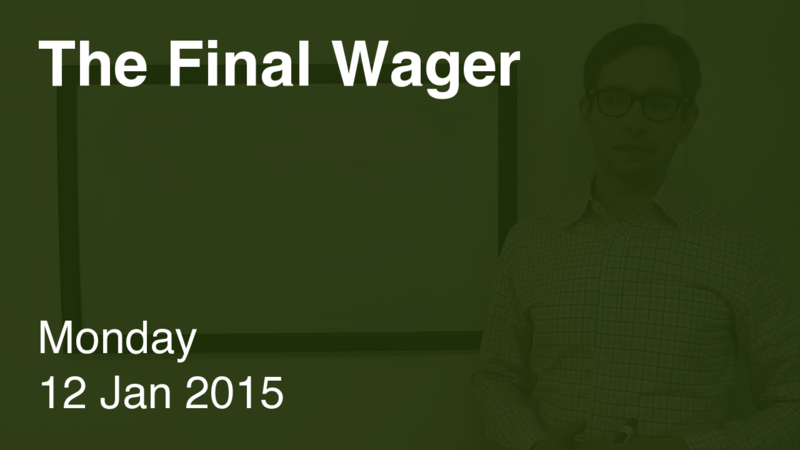 To cover this all-in wager, John will need to wager 7,600. An incorrect response with that wager will leave John with 16,800. To get above his total, Lauren must wager at least 800, but might as well go for everything. 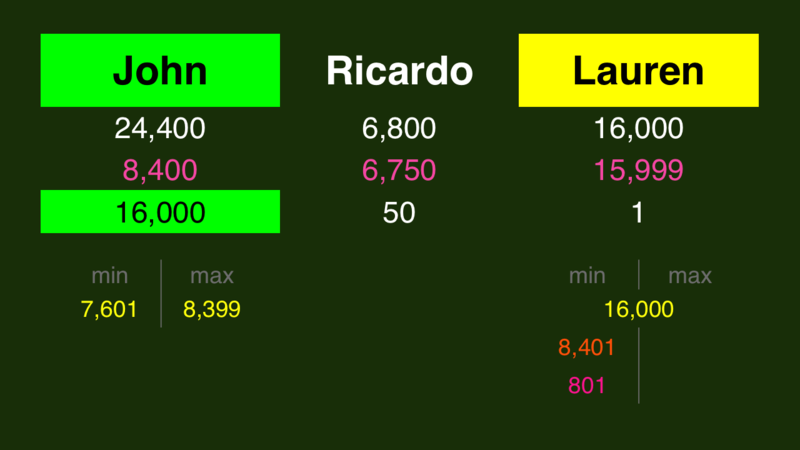 Ricardo is eliminated from contention, and should wager to leave some in the bank. John and Lauren are separated by 8,400, so John should cap his range at 8,399. Some high scores but some easy math. If John, Elliot Yates, and Vaughn Winchell all make the next Tournament of Champions, it’ll be at least the second time back-to-back-to-back champs have done so: in Season 28, Dan McShane (4x) defeated Dave Leach (6x), who had previously defeated Jason Keller (9x). All three made the semifinals, but never crossed paths in the TOC. In the video, I talk about the 1120 sinking of the White Ship, which caused a period in history known as The Anarchy (amazing name). Who was T.E. Lawrence [of Arabia]? In the last 10 games (counting tonight) in which we had three players in Final Jeopardy we have the following result: In 2 cases all three got it right = easy. 2 cases of 1 right + 5 cases of 2 right = 7 ok and 1 case of 0 right = hard. So that’s a “final jeopardy degree of difficulty = just right” score of 70% but the “average degree of difficulty” score (higher is easier) dropped to 1.80. The “no triple stumper on FJ” streak now stands at 0 days since we had one today. Keith thought it was a tough clue. I thought it was an easy one. My methodology says Keith is right. Keith, I have a correction. John wagered 8,000 and not 8,400.